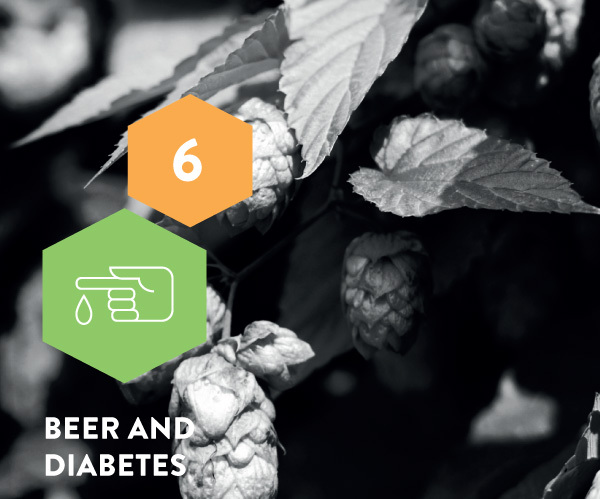 As beer contains alcohol, it can have an effect on diabetes. There is considerable scientific evidence that alcohol consumption of up to 24 g per day can lower the relative risk of type 2 diabetes by up to 30%. In people with diabetes, moderate alcohol consumption may improve glycaemic control and convey cardiovascular risk reduction and mortality benefits. These effects apply to all alcoholic beverages. Moderate beer consumption may lower the risk of developing type 2 diabetes, because of the alcohol in beer. Alcohol consumption of up to 24 g per day can lower the risk of type 2 diabetes by 30%, and appears to be more pronounced in women than in men. Increased adiponectin levels, increased insulin sensitivity, reduction of fasting insulin, glycaemic status control, and anti-inflammatory effects, are biological mechanisms that explain this association. In addition to a healthy lifestyle, moderate alcohol consumption can also protect against type 2 diabetes. People with diabetes can also benefit from moderate alcohol consumption, with a lower risk of dying from coronary heart disease and a lower risk of microvascular complications. Multiple biological mechanisms that may explain how alcohol consumption affects type 2 diabetes risk have been explored in intervention studies. Increased adiponectin levels (10%) have been observed in subjects consuming alcoholic beverages (20–40 g of alcohol per day) compared to abstainers. 121 This increase in adiponectin levels is suggested to be the most important mechanism, explaining about 25–30% of the relationship between moderate alcohol consumption and lower risk of type 2 diabetes. 157Adiponectin is a signalling peptide secreted by adipose tissue. It has been shown to increase insulin sensitivity,158 and higher adiponectin levels have been associated with a lower risk of type 2 diabetes. 159 Furthermore, adiponectin is inversely associated with inflammatory markers related to type 2 diabetes risk. 160Adiponectin is predominantly secreted in the adipose tissue of the buttocks and legs, 161 which may contribute to explaining why alcohol may give better diabetes protection in women compared to men. For people who have diabetes, moderate alcohol consumption may affect blood glucose level and complications related to diabetes. 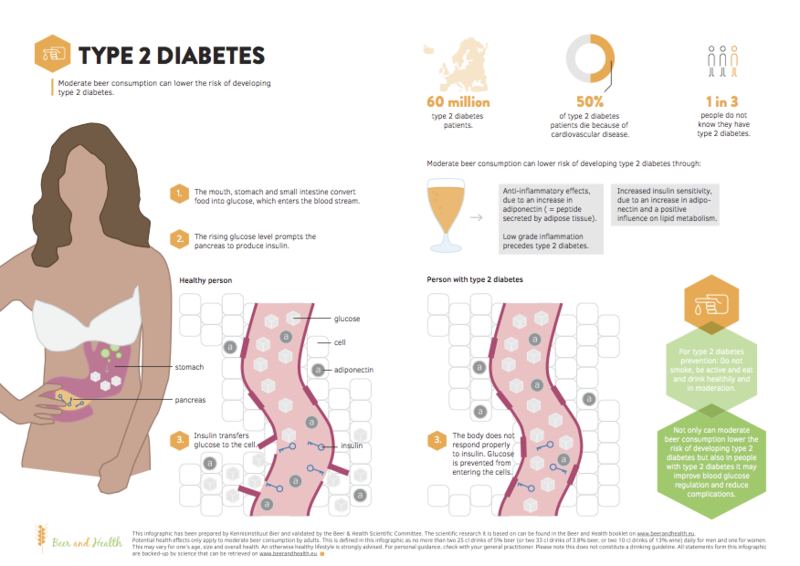 Type 1 diabetes accounts for around 10% of all diabetes worldwide. It is characterised by deficient insulin production due to the autoimmune destruction of pancreatic cells. Insulin is a hormone produced by the pancreas that regulates the absorption of glucose from the blood. Type 1 diabetes is not preventable with current knowledge, and treatment requires the daily administration of insulin. 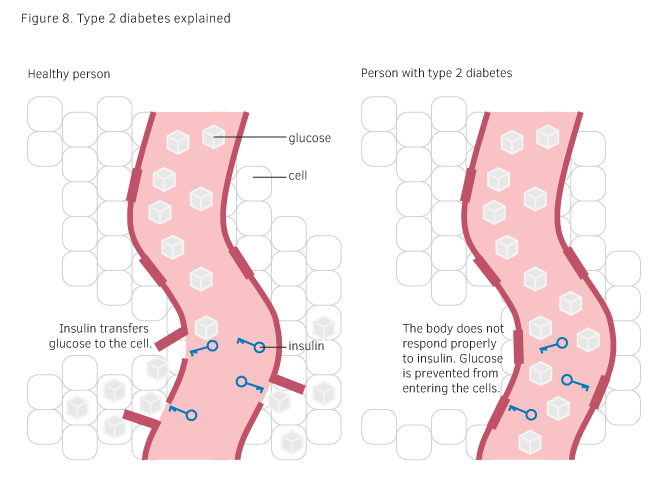 The glycaemic response (GR) is the blood glucose response after eating food or a meal that contains carbohydrate. The glycaemic index (GI) is the GR after eating a portion of food containing 50 g (or in some cases 25 g) of available carbohydrate measured within a period of two hours. The GI is expressed as a percentage of the GR after 50 g (or 25 g) of the reference carbohydrate (i.e. either a glucose solution or white wheat bread, defined respectively as the glucose scale or the bread scale). Foods having carbohydrates that are digested, absorbed and metabolised quickly are considered high GI foods (GI ≥ 70) whereas those that are digested, absorbed and metabolised slowly are considered low GI foods (GI ≤ 55). The glycaemic load (GL) expresses the total available carbohydrate content in a given amount of food, multiplied by its GI: (GI × carbohydrate (g))/100. Foods with a GL ≤ 10 are been classified as low GL, and those with a value ≥ 20 as high GL. Beer is classified as a high GI food, with the GI of lager beer around 100178,179, comparable with the GI of potatoes or breakfast cereals. 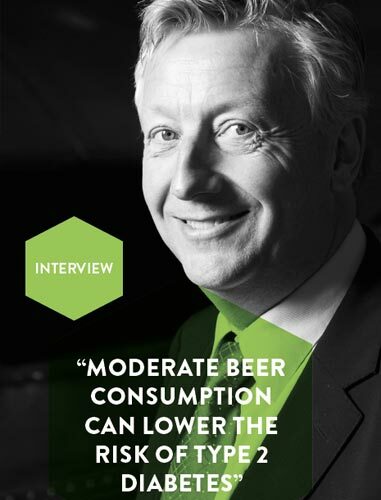 180However, the GL of beer is only 7.5 because of the low carbohydrate content (7.5 g carbohydrates per 250 ml*). In comparison with other products, a glass of a regular soft drink has a GI of 63 and a GL of 16, and a boiled potato of 150 g has a GI of 96 and a GL of 24. 180Although diets high in GI or GL have been associated with an increased risk of diabetes, 181alcohol consumption up to 24 g per day is related to a lower diabetes risk. 149-151This contradiction might be explained because when beer is consumed with or before a carbohydrate meal, beer tends to reduce the blood glucose peak after the meal. The biological mechanism behind this is likely to be alcohol’s ability to acutely inhibit glucose production in the liver and so counteracts the blood glucose response as a result of glucose absorption from the food/meal by the gut, and thereby reducing the overall GR (blood glucose peak). This results in more stable blood glucose levels after the food/meal, and that might consequently reduce the risk of type 2 diabetes. 182As alcoholic beverages are often consumed together with a meal, the GR of beer consumed together with a meal might be more important to consider for diabetes risk than the GI of beer itself. *Based on an average carbohydrate content of 2.5 g per 100 ml. Some beers will be higher or lower. Compared to healthy lifestyle habits that lower the risk of type 2 diabetes, how large is the impact of moderate alcohol consumption? Beer as with most other drinks, contains calories. How does moderate beer consumption decrease the risk of type 2 diabetes? If you had unlimited funds, what would you like to research in the area of moderate beer consumption as part of a healthy lifestyle?